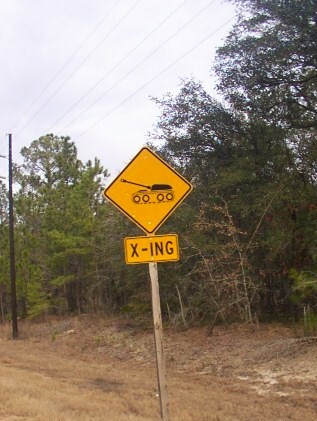 We saw lots of these signs in Fort Stewart, near Savannah, but never had to stop for a tank. We saw many many tanks parked at the camp, however. We visited the place where the maintain and repair the tanks. They have a big pit called the "Bird Bath" where they can wash tanks with several high-power water cannons.